From Where I Stamp: My Digital Studio New Downloads! 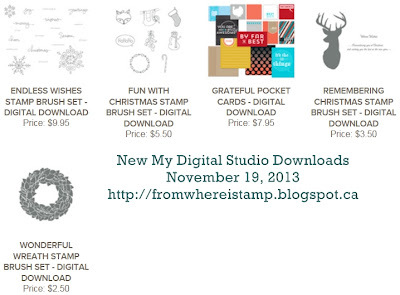 My Digital Studio New Downloads! Happy Tuesday! Stampin' Up! 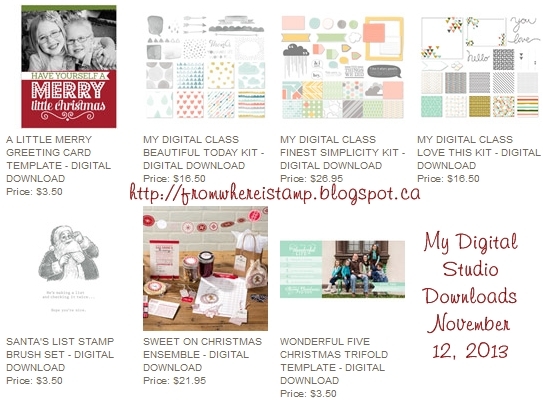 has released new My Digital Studio downloads today. View them in my online store or on the MyDigitalStudio.net website. I missed posting last weeks new downloads and wanted to point out the new My Digital Classes! The My Digital Classes provide all the basics you need to make the most of our My Digital Studio product line. You'll discover just how quickly and easily you can create cards, pages, home décor and other projects with MDS, our intuitive design software. View the new downloads in my online store or on the MyDigitalStudio.net website. And make sure to take advantage of the MDS 30% off sale of select holiday downloads and print products until November 30! Print products include photobooks, swatchbooks, cards, tags, and individual pages. Click here to see the sale prices! And check out these amazing downloads to help you get ready for the holidays!